Carte-a-figure map of Asia from Moscow in the west to the Pacific Ocean in the east. Shows Korea as an island and also a part of Alaska. America is separated from Asia by the Strait of Anian. Along the top of the map are views of Astracan, Samarchand, Cambalu and 'The house of Nova Zemla' whilst along the left and right borders are 8 representations of local inhabitants. Cambalu was the name used by Marco Polo for the city of Beijing (Peking) which is incorrectly show on the northern side of the Great Wall. Just above the Great Wall is text which reads "In this Country is a hil out of which they dig earth called by Pliny terra Asbestus, having fine veines like grasse which being spun and weaved yeeld cloth that wil nut burn in the fire". 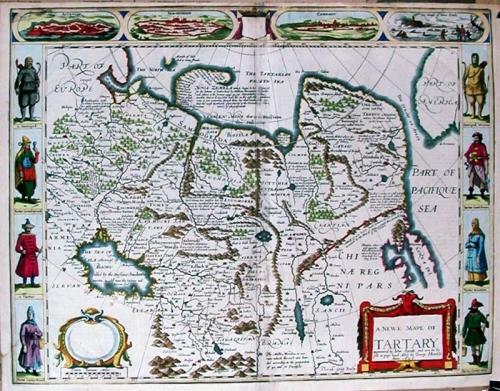 English text on verso describing Tartary. Beautifully coloured. Centrefold slightly discoloured.